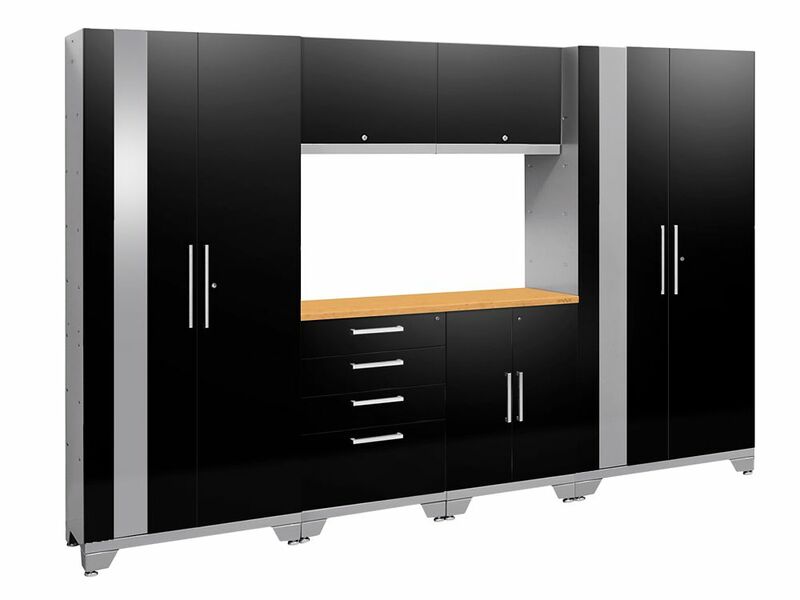 Performance 2.0 Series 7 PC Set in Black Get all those cables, decorations, and gardening tools off your garage floor and into NewAge Products newly redesigned, Performance 2.0 Series modular garage cabinetry. These cabinets are built to last with their fully welded, 24-gauge steel frames and fully lockable, double walled doors. Our configured sets are shipped with adjustable steel shelving; easy-to-grab stainless steel handles and height adjustable levelling legs that accommodate uneven garage flooring. The manufacturers limited lifetime warranty gives you the insurance that your cabinets will look great for years. Performance 2.0 Series 7 PC Set in Black is rated 5.0 out of 5 by 9. Rated 5 out of 5 by Vince from Great bargain for the price. The units have spacious storage drawers with pads installed inside t... Great bargain for the price. The units have spacious storage drawers with pads installed inside the tool cabinets. Installation was easy...if me and my wife can do it, so can you. Great addition to the garage area for football season. Yes, that's a 55-inch TV guys!!! Rated 5 out of 5 by DavyB from Product was even nicer than I anticipated. Packaging was... Product was even nicer than I anticipated. Packaging was outstanding. Assembly was quite straight forward. Love the look and function! Rated 5 out of 5 by Marilynn from The product is excellent, but unfortunately one cabinet door arrived... The product is excellent, but unfortunately one cabinet door arrived badly dented. I contacted the manufacturer, and they agreed to send a replacement door. So if/when that door arrives, I am very pleased with my purchase.